In this unique book, Adam Wyeth unravels the many rich and varied ancient Celtic legends which run through contemporary Irish poetry. Each chapter begins with a poem by one of Ireland’s leading poets, followed by sharp, shrewd analysis of its making and references. As well as poetry’s inner workings, the reader will discover a wealth of Celtic culture – their gods, heroes and folklore – and its continuing role in shaping Ireland’s identity in the twenty-first century. Celtic mythology is far from a dead or peripheral part of our history; its narratives and traditions are deeply intertwined into the fabric of our daily lives. As each generation re-visits these ancient tales, our personal and expanding lives offer fresh interpretations of these age-old myths. Including poems by Eavan Boland, Eiléan Ní Chuilleanáin, Nuala Ní Dhomhnaill, Bernard O’Donoghue, Paul Durcan, John Ennis, Desmond O’Grady, Seamus Heaney, Derek Mahon, Mary O’Malley, Paula Meehan, Patricia Monaghan, Paul Muldoon, Maurice Riordan, Leanne O’Sullivan and Matthew Sweeney. Adam Wyeth was born in Sussex in 1978 and has lived in County Cork since 2000. His critically acclaimed debut collection of poetry, Silent Music (Salmon Poetry, 2011) was highly commended by the Forward Poetry Prize. He was a runner-up in the 2006 Arvon International Poetry Competition, a prize-winner in the 2009 Fish International Poetry Competition, commended in the 2012 Ballymaloe International Poetry Competition, and shortlisted for the Bridport Prize, 2013. His work appears in The Forward Book of Poetry 2012 (Faber, 2011), The Best of Irish Poetry 2010 (Southword, 2010), Landing Places: Immigrant Poets in Ireland (Dedalus Press, 2010) and Something Beginning with P (2004). He has made two films on poetry, A Life in the Day of Desmond O’Grady, first screened at The Cork Film Festival, 2004; and a full length feature, Soundeye: Cork International Poetry Festival, 2005. Wyeth’s debut play Hang Up, produced by Broken Crow, has been staged at many festivals, including the Electric Picnic and the Galway Theatre festival. A member of Poetry Ireland’s Writers in Schools Scheme, Wyeth also runs a series of international online creative writing workshops at www.adamwyeth.com. so close I could have touched her with a stick. bore her away and brought her back. the same malt-pale October sunlight. for she came alert and looked at me. of the eyes above the gorping mouth. without talons or guile to defend it. On first reading, this poem may seem not much more than an intense but otherwise straightforward encounter with a crow. But a little scratch beneath the surface of Riordan’s subtle lyricism reveals it is in fact laced with Celtic imagery and folklore. Badb (rhyming with ‘have’) comes from the Irish for the shape-shifting warrior Goddess (hence Riordan’s use of the female gender) in Celtic mythology, who often took the form of a crow (in some interpretations the raven), symbolizing the cycles of life and death, wisdom and inspiration. Sometimes known as Badb Catha (battle crow), she often caused confusion among soldiers to move the tide of battle to her favoured side. Battlefields became known in Ireland as the Land of the Badb. Birds play a major role in Celtic mythology, figuring as divine emblems and messengers of the gods. In more recent literature we are reminded of one of England’s most renowned poets, Ted Hughes (for whom this poem is written). Hughes reinterpreted the crow in a book-length sequence of poems that is perhaps his most notable work, creating an extensive folk-mythology of his own. In his poems, crow is a kind of man-bird – undergoing various adventures in a dark and disastrous world. But even without these facts the poem has a ghostly allure that insinuates something more. Riordan opens the poem in a conversational tone. The sound-making of the first line with the ‘W’ alliteration, ‘I was walking where the woods begin,’ has a sense of the elements about it. The ‘W’ sound creating a wind chamber in the mouth as the line is spoken, making us feel we are out there with the poet immediately – ‘eye level with the tops/ of nearby trees’. The writing becomes alive through the use of all the five senses throughout. First of all there is sight, ‘eye level’. ‘Eye’ is mentioned three times in the poem as is ‘look’. Then touch, ‘so close I could have touched her with a stick’; and ‘woodland smells’, while ‘tangy’ suggests taste, as does the onomatopoeic, ‘gorping mouth.’ ‘Then I must have made a sound’ leads us into the crow’s beak springing ‘open to deliver its single rough vowel’ – before the flapping sound of ‘a few wing beats’. All this rich detail draws us into the piece as if we are there – looking at the crow, so close we actually feel ‘that interval before the legs/ could lift her weight from the branch’. But another reason for the five senses is to take us to the next level, the sixth sense, which is the power of perception seemingly independent of the five senses. It is to do with our intuition, the sense of hunches and gut reactions, also known as second sight. This occurs when the crow delivers ‘its single rough vowel’. In Celtic mythology, the cry of the crow was often interpreted as the voice of the gods. It also appears when the bird and speaker meet eye to eye (‘the look known to legend and folk belief’.) This extra sensory perception brings all the mythology of Badb together. When Badb took the form of a crow it was taken as a prediction that someone was going to die. The slowed down, zoomed-in description of the bird, brings us closer, so we become aware of the power of Badb, as she holds him off ‘with a look’. An oblique reference to the strong roles female deities played in Celtic myth. Then ‘in a few wing beats’ we see Badb retreat back to the bird world, becoming an anonymous part of the flock, ‘indistinguishable from her fellows’. The image of the birds ‘wheeling/ above the trees’ gives a sense that they are part of the heavens. The poet might not just be ‘wheeling’ from the rushing up of the crow, but also subconsciously linking this movement to the Celtic idea of the wheel. The ancient Celts sometimes buried model wheels with corpses as symbols of the sun to light the way of the dead to the otherworld. To the ancient Celts, the Earth was alive and sentient, both matter and consciousness. They venerated all natural phenomena, including water, trees and of course the sun – all of which are mentioned in this poem. ‘Carrying on their business’ alludes to the Crow’s connection with the spirit realms and also hints at a line from Hughes’s first masterpiece, ‘The Thought Fox.’ In the poem, Hughes describes the fox as, ‘coming about its own business.’ It is a poem about writing and being visited by the muse. ‘Carrying on’ is a pun on ‘carrion’: the decaying flesh of dead animals and also the common species of crow. Badb sometimes took the form of a carrion crow, most notably on the shoulder of the mythical warrior, Cú Chulainn, after he died in battle. The paradoxical last line, ‘neighbourly and otherworldly’ picks up on a previous line, ‘she was creaturely and unwary,’ providing an effective juxtaposition, subtly suggesting the Celtic outlook on life after death, where the otherworld is next door to us. Three years after this poem was published Ted Hughes died, adding another dimension to the crow’s symbol of prediction. Perhaps another spooky foretelling is found in Riordan’s line ‘malt-pale October sunlight’. In poetry, the seasons are often a metaphor for age. (October here can then be seen as Hughes being in the autumn of his years.) Moreover, to the ancient Celts, autumn/winter is when the strength of the gods of darkness and the underworld grew great. Hughes died on October 28th, three days before Samhain, (pronounced ‘Sow’ en’) the eve of the Celtic New Year, the last day of October. Samhain was a time to celebrate the lives of those who had passed on. It is seen as a festival of darkness. The long barrows where dead heroes were buried in pre-Christian Celtic society are also the fairy mounds, which are supposed to open up at Samhain. As with many pagan and Celtic traditions, it later became amalgamated into Christianity, and is now of course popularly known as Halloween, the Eve of All Saints Day. But many of its rituals and superstitions still survive in rural parts of Britain and Ireland today. Heaney, a close friend of Hughes, said, ‘A good poem goes that little bit further and leaves you walking on air...’ or in this case – ‘wheeling above the trees’. 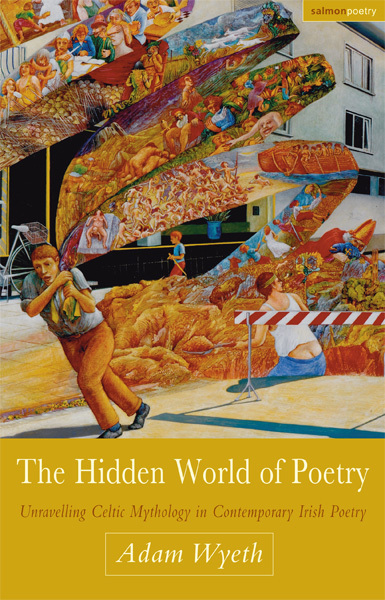 Adam Wyeth’s The Hidden World of Poetry: Unravelling Celtic Mythology in Contemporary Irish Poetry is a useful and intriguing introduction to both subjects mentioned in the title. The book is composed of a series of tightly-written essays that use close readings and the author’s encyclopaedic knowledge of Irish mythology to parse poems by the best-known contemporary Irish poets. The essays are interspersed with Miriam Logan’s lucid, richly atmospheric ink-paintings and each essay is introduced with a quote from an appropriate expert on the psychology of myths, from Bjork to Yeats, and Italo Calvino. The word ‘Celt’ itself is shrouded in mystery, believed by some to come from the Greek, ‘Keltoi’, meaning ‘hidden people’ – a reference to their lack of written records perhaps, and tales which were passed down through the generations by the druids and poets who studied long years to commit all their knowledge to memory. The poem uses the changing phases and faces of the moon as a device for Sweeney’s state of mind. ‘Fat and fair-faced,’ ‘gleaming glance’, when he was a blood-lusty warrior; to ‘lean and stern of late.’ Shedding his ‘feathered cloak’ and running ‘naked with wolves’ alludes to another transformation. Wolves feature prominently in Celtic mythology. The Irish word for wolf is Mac Tire meaning literally the Son of the Countryside and has associations with human transformation. In Monaghan’s own Encyclopaedia of Celtic Mythology and Folklore she describes the wolf as a creature that could see into the otherworld. Down through the ages, the full moon has strong connotations of transformations – especially into werewolves. Wyeth’s analysis digs much deeper than history and image; he has an ear for sound, for the music of poetry and the layers of meaning that verbal music can add to a work. Discussing Mary O’Malley’s sensual poem ‘Bean Sidhe’, Wyeth reminds us of Alexander Pope’s belief that, “sound must seem an echo to the sense.” Referring to the poem, Wyeth says that, “The sound-echoes sensuality is deepened through the physical end-rhymes that move down the poem, such as, ‘lips/hips’, ‘oh/grow’, ‘dry/eyes’.” The great strength of this book grows from the combination of technical study and elaboration on the themes of myth. Form and content are explored together and the result of this is that the reader leaves with a deeper understanding, not only of the history behind the poems, but of how the poems generate their strong effect. You can’t judge a book by its cover is an old and sound saying, but in this case the marvellous cover is a reliable guide to what you will find within — to wit marvels, wonders, vivid encounters with the imagination of the ancestors. You will meet them in their myths and legends, with their heroes and gods; you will access their understanding of the interdependence and interpenetration of human and animal worlds, and of this world and the otherworld. Adam Wyeth reminds us that one etymology for, or source of, the word Celtic is Hidden. So the book is essentially sixteen individuated forays into the minds, inspirations and compostional habits of contemporary poets. Each of the sixteen poems under his forensic gaze yields up its hidden treasure trove of poem lore and myth lore and what are the myths but the poems of the ancestors? Each essay can be read on its own but together they braid into a whole and they too are interdependent and interanimate each other. We apprehend in these elegent readings what I call our aboriginal mind, so crucial as an antidote to the growing institutionalized mind which marks and, I believe, afflicts so much of our human culture in an age when we are the most dangerous species on the planet, a danger even to ourselves. The institutionalized mind keeps wittering on about accountability and transparancy till those words have lost their meaning and what they actually represent now is erosion of democracy and increase of bureaucracy. The institutionalized mind – devoid of a shred of common sense will, if left unchecked, drive turbo development and exploitation of dwindling resources to the point where we will make this home planet incapable of sustaining us. This book connects us back to a Celtic dreamtime through mythology which is, no more, no less than the poetry of the ancesters. It reaffirms the vestigial and, paradoxically, central role of ancestral thought in contemporary Irish poetry in general, and in this generous selection from contemporary makers in particular. It illustrates the continuity of the trade back through the technologies, virtual and print, into the oral tradition. We can hear back to the bronze age culture of the Milesians, and read back to the first writing down of the myths and legends in the 6th to the 11th centuries. So Adam’s book is both nourishment and boon for readers in the English language who might not have access to the lore in the mother tongue. One of the unexpected gifts of this book for me has been that it has encouraged me to go back to the source – to the mother tongue. The huge number of the ancient manuscripts that are being digitized means we can look at the very texts themselves that carried the oral tradition into the written tradition. For example the site Irish Script on Screen, or the digitized holdings of the Royal Irish Academy, and many more such sites, allow us access from our own armchairs to heretofore remote and precious, sometimes unavailable for reasons of conservation, ancient manuscripts. A lovely irony that the machine age with its digital memory restores to us a version of our earliest imaginings. Adam Wyeth is exactly the kind of reader poets dream of. Deeply intuitive, interested in everything to do with words. Pasternak remarked that each word comes to us carrying all its ghosts; Adam, as a learned and productive poet himself, respects those ghosts and understands the shamanic heft, the magic potential of each word, and the spell-like nature of a line of poetry, each word and its host of etymological ghosts in its fated place. Adam quotes Ralph Waldo Emerson who says “Language is fossil poetry.” And becuase he is a fine poet himself he inspires confidence: he opens up, and is an impeccable guide to, the craftworking and deliberate shaping of each poet, and the poetry lore is as erudite as the folk lore. He gets the anvil music, the fluent song of water. He brings a wealth of reference, historic, archeological and literary to his readings of the chosen poems. And they are read with love, respect and enthusiasm. He opened up new readings for me in poems I thought I knew well – Leanne O’ Sullivan’s ‘Promise’, Paul Muldoon’s ‘Mayfly’. Indeed he opened up new readings for me in my own poem and reaffirmed what I have long suspected — that the maker of the poem is not necessarily the poem’s most informed or nuanced reader. One can be blind, as the poem’s maker, to what is blindingly obvious to the poem’s reader. Ancient history is by its very nature highly speculative; and while I might argue with some of Adam’s speculations I applaud wholeheartedly the verve and coherence of those speculations. A lovely word itself – speculate. One of its meanings is to look at from a vantage point and that expresses exactly what Adam has achieved. Another, though by no means the least, of its achievements is, to be a kind of core sampling through the living generations of Irish poets writing in English, which might be termed our stepmother tongue, with one representative from the mother tongue. Informative as to backgrounds, publications, contexts for writing, it is a solid introduction to a generous helping of beautiful poems. And the placing of these recently made poems — their ink hardly dry, their soundwaves hardly digitized: by placing them against the earliest stories on the island it frees them of any individuated ego driven energies of the ‘poetry bizniz’ and restores them to their rightful place in a long continuum of makers, native and incoming, who are known to us mostly as the genius ‘Anonymous’. I convey my gratitude at being placed in such company, both of this world and of the otherworld.